Peach is an amazing juicy fruit which originates from China and is loved by millions of people throughout the world. It is a low calorie fruit with great aroma valued for its rich chemical content which includes numerous nutrients and vitamins. Health benefits of peach juice embrace various therapeutic properties of this fruit, as well as its great refreshing and nourishing actions. Raw peach juice can be a great solution to quench the thirst and recharge your body with energy and optimism. Peaches and raw peach juice are great sources of microelements like iron, zinc, magnesium, manganese, calcium, iron, sulfur, and others, as well as vitamin A, vitamin B1, vitamin B2, vitamin B9, vitamin C and vitamin E. Drinking raw peach juice is linked to many advantages and benefits to your health. After juicing the peaches, it is recommended to add some other juices like orange juice or apple juice as raw peach juice sometimes can be too thick. Check out top 5 health benefits of peach juice. 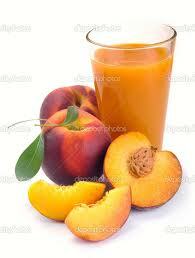 Raw peach juice can be used to combat various digestive problems. This juice is rich in alkalines which help relieve the symptoms of gastritis, indigestion, constipation, heaviness in the stomach, meteorism, flatulence, nausea and so on. It is a great natural remedy to fight digestive problems caused by headaches, stresses, anxiety, menopause and other similar conditions. Raw peach juice can be used to remove worms from the intestines. It aids kidney function. Raw peach juice benefits include excellent diuretic and laxative properties; therefore, this natural product can be used to tone and stimulate the function of kidneys and bladder. Regular consumption of raw peach juice is linked to lower chances of nephritis and other numerous diseases of kidneys and liver. It can assist in dissolving kidney and bladder stones. This juice can be used to support heart health. First of all, it helps strengthening heart muscle and stimulate blood flow. As a result, this leads to improved blood pressure, lower cholesterol levels in blood and lower chances of atherosclerosis, myocardial infarction and other serious cardiovascular diseases. This natural product is a great source of iron, therefore, raw peach juice benefits include protecting us against anemia. Raw peach juice is a great solution for weight loss. 100 ml of think and nutritious peach juice have only 57 calories, making this beverage very good for weight loss. Peaches and raw peach juice are very often included to numerous weight loss programs and diet plans. Health benefits of peach juice include boosting our immunity system. Due to a high content of natural vitamins, raw peach juice can assist our body in developing great natural protection for many common diseases and ailments. Drinking peach juice also helps to support healthy vision. Peach juice is known to contain compounds known as zeaxanthin and lutein which are known to aid in preventing harmful eye conditions such as cataracts and macular degeneration. Peach juice is also beneficial for healthy kidney function. A diet high in peach juice aids in stimulating the function of the bladder and kidneys and lowers the risk of diseases linked to them such as kidney stones and nephritis. Peaches may also be used to help treat digestive problems and alleviate ailments such as indigestion, constipation, gastritis, and flatulence. Peach juice is also significantly low in calories, making it the perfect addition to a weight loss diet. Peach is helpful in anger. It is useful in pregnancy and regular use help giving easy birth. Use its juice as tooth paste, it will whiten your teeth and give them strength to gums. It is useful in any kind of fever if you use it regularly. Its regular use increases the brain power and the power of remembering the things for long time. For the people who have problem in the blood cells, e.g. their blood cell reproduces lee, they should eat one peach in the morning with empty stomach and drink a glass of milk after it. It is equally useful for the people who mostly bear constipation as peach is a fruit which is an ultimate cure of constipation. As it is a great tonic for the stomach, it also helps in increasing your appetite along with purifying blood and keeping stomach happy.